Vaughan, ON―I want to show you this demonstration with my vibration plate. It’s the CT Vibro Platform from Circular Traction. The purpose for the vibration plate is to produce a whole-body vibration, from toe to head from foot to head. Now the purpose for using it in my office, I do structural corrective care as a chiropractor. So what it does is it produces this whole body vibration effect and massive proprioception stimulation to the nervous system and brain. What that means is that it’s producing a lot of mechanical sensory information to the brain because of these small vibrations that are going through your body. And when I put people on this, I’ll demonstrate in a moment, and I give them postural corrective exercises and while they’re on the plate vibrating, they’re brain is picking up a whole bunch of information quickly. And now it wants to try to maintain the body in a new position. So basically it’s retraining posture very, very quickly, with a lot of information to the nervous system and back to the postural muscles. So let me show you, this plate over here and I got to turn it on so you see what it looks like. So I flip the camera around. So here’s the platform of vibration plates. Before I show you how it works, this is very important and this list of contraindications is bigger than this, but it’s not for anyone that’s pregnant, has acute thrombosis, heart conditions, fresh wounds, artificial joints, body parts, spinal pathologies, diabetes, epilepsy, acute migraines, acute inflammatory conditions, pacemakers, tumors and there’s a whole other list of contraindications that I have as well. So this is the exclusion criteria. Not everyone goes on there. When someone can go on, this is how it works. So there’s a switch here with different settings and as I turned it on it starts to vibrate. Let me show you now I will put a block on so you have a reference point. The plate has different settings. This is the frequency in hertz, so anywhere up until the 20 hertz, setting 3, on this machine is good for muscular ligaments and joint relaxation that is the relaxation settings. Over here, settings four to six. This is the range where it starts to give you a whole-body vibration that’s been shown in research to have a maximum effect on health. So a 27 to 40 hertz is great for proprioceptive neuromuscular re-education, which is what I was telling you about earlier, postural correction. And then higher settings, not recommended for for everyone. This is good for soft tissue absorption of a force, very high setting. We’re not going to go into this setting here. So I’m going to set it to a 33. Now I’m going to go on this and you get to see what I’m talking about. I’m going to stand on it. Right now I am standing on the vibration plate. My whole body is vibrating. You might not see it there. So what I do is I place this block behind my back over here, stop myself, put my head back and start working on my posture. Lots of information is going to the brain to reeducate that postural position. Relax and that can be that 10, 20, 30, 40, 50 times. It feels really, really relaxing as well. Hope you found that useful and I’ll catch you on the next video. Number one, if you have had back pain for eight months and it’s persisting, and it is not 100 percent resolved, you do need to get that check professionally. Some testing needs to be done. Check your spine, maybe get x rays, MRI if necessary. So just consider that, if you’ve had chronic pain for eight months now and it hasn’t been resolved. The other thing too is what’s your sleeping position like? Are you sleeping on your back, on your side, on your stomach? So if you’re on your back or on your side that is what I recommend. On your stomach, I don’t. If you have a situation where you wake up in the morning with backache, but you felt fine going to bed at night, then what I recommend is a couple of things. Number one, lying flat on your back and put a pillow under your knees and a number two, if you’re a side sleeper, you sleep on your side, then put a pillow between your knees. If you go on my youtube channel, Youtube.com/DrWalterSalubro, I have a video that shows sleeping positions for people that have back pain or leg pain. So check that out. Now, here’s a good stretch for you to do in the morning if you wake up with a sore back from my sleeping throughout the night. So in the morning before you actually get out of bed, you’re on your bed, lie flat on your back, and you going to do what’s called the knee-to-chest stretches. They really help stretch the lower back area and provide some relief before you get up off your bed. And then I’ll show you a proper way to actually get off your bed so you prevent further injury to your back. Check this out. You’re on your bed, you’re lying down, and before you get up grab your knee, pull to your body and you have a hold for 10 seconds. Pull upward, hold 10 seconds, repeat that three times. Do the opposite side, hold 10 seconds, repeat that three times, and then do doubles for 10 seconds, repeat three times. And then when you get off your bed, go to your side with both feet together, feet down, hands on your bed, and you push yourself off like that. So you come up in a nice neutral position and stand. Easy, easy stretch you can do in the morning if you have an achy back when you wake up in the morning. Just stretch it the way I showed you and get up without aggravating your back. Also remember to check the part of the video where I explained some sleeping postures and positions and how to use pillows to support your back while you’re sleeping at nighttime and have your back more relaxed and less tense. You can also put a heating pad on your lower back before you go to bed for about 10 minutes because that will warm up your muscles, relax them, and allow them to rest at nighttime. Hope you found that useful. I’ll catch you in the next video. Vaughan – Is an L4 L5 disc bulge curable? Can L4 L5 disc bulge be repaired? Can it get back to normal? Can it be resolved, an L4 L5 disc bulge. In fact, can any disc bulge be fixed or resolved? That’s one of the common questions I get asked in my comment section below my videos on my YouTube channel (www.YouTube.com/drwaltersalubro), so I want to answer this question for you today. 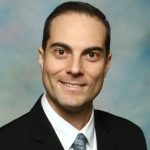 Hi, my name is Dr Walter Salurbo from Back to Health Chiropractic Center in Vaughan, Ontario. One of the most commonly asked questions I get is about disc bulges and what kind of options can be done to help prevent surgery and how could the problem that causes the bulge be corrected? So, I want to address this today. Most people ask me if it’s curable or not and I understand why they’re asking. Many people have been found to have a disc bulge with associated symptoms such as low back pain, muscle stiffness, restricted mobility, shooting pain down the legs, like sciatica, radiating pain down the legs, numbing and tingling, discomfort or irritation down the legs. That’s a concern and it’s very disabling to have these type of low back conditions and symptoms. The truth is, many people that I have talked to in my comments section and in my YouTube channel have told me that they want to prevent surgery. They want to know if this bulge is actually fixable. Now, let me address that and clear up some misconceptions and confusion. The truth is that if you have a disc bulge or herniation, it’s very possible to receive certain types of treatment and care that will help you get back to a normal level of function in your life. It’s also very possible for surgery to be prevented. Now, I don’t use words like cured. I don’t know if a disc bulge can actually be cured. What I do know is that the associated symptoms that come with this bulge can be cleared up. And I do know that people can actually return back to a normal function. How? Because I’ve seen this day in and day out, week in, and week out in my office. I think what’s important to know is that it’s not so much about curing the disc bulge, but it’s more about correcting the structural problem that led to derangement in the disc, the disruption of the disc, or even the disc bulge. So let me explain. Here’s a spinal model. The low back spinal model. So there’s five vertebra and in between each bone, we have our discs. This here would be an example of a disc bulge . This is a lateral disc bulge, some others are posterior lateral, which means back into the side and some go centrally meaning straight back. So once the disc is disrupted and it’s bulged, that’s essentially irreversible, permanent damage to that disc. Whether it loses height, or it becomes dried up, that’s irreversible damage to the disc. So, you’re not going to really change much of that structural disruption of the disc. However, what I want to know is what caused it, what led to that disruption and to that bulge? If someone’s spine was tilting like that, then that can lead, over the years and decades, to a disruption in the fibers of the disc that causes the inside nucleus to actually bulge out. So my question is what caused this alignment problem or what’s going on to cause a disruption of the disc and is it an alignment problem? What if the alignment problem is going forward. Then that will disrupt the disc forward and also possibly bulge it backwards. What if it’s going backwards? That again can disrupt the disc and bulge it backwards. So the appropriate question is what can be actually done to correct the structural abnormality to reduce the pressure on the irritation on the disc and thereby alleviate the inflammation and inflammatory response that’s associated with the disc bulge and therefore alleviate all of the associated symptoms that come with that? And one of the best things that I’ve seen and helped a lot of people with this is corrective chiropractic care and chiropractic care in general. This involves adjusting and correcting the actual spinal misalignments, also called subluxations. And in doing so, when you realign the spine into a better position, a more optimal ideal position, what it does biomechanically and structurally, is it reduces the abnormal stress on the discs that led to the disruption and bulge in the first place. And in doing so, when the abnormal stress is eliminated, now the disc actually has time to breathe essentially, to actually exist free of irritation. Therefore, there’s no need for the body to produce an inflammatory response and when there’s no inflammation, there is no swelling and all the cardinal signs that come with inflammation; the blood flow and the irritation that goes there that triggers pain response. So, all of that begins to get reduced and eliminated and that’s what happens with many of my patients that have a disc bulge, as we correct the structural underlying problem, misalignment of the spine. If someone doesn’t feel it, it’s most likely still there, and I’ve seen that in MRI reports, but I have many patients that that are doing better with their bulge condition. They have reduced back pain by 90 percent or even eliminated the actual progression to surgery and reduced their intake of medication. They are walking, standing and bending normally. They are back working and playing and doing all the things in their day to day life that they want without the drugs, without the surgery and gained their strength back with specific chiropractic adjustments. And, of course, we also provide supportive recommendations such as core exercise, training, mobilization, balance work, and a bunch of other things to add to the stability of the spine. I hope this answers the question if a disc bulge can be cured and the key is to remember that it’s not so much about curing or fixing the disc bulge, but to correct the structural abnormality or the structural misalignment, also called subluxations, of the spine that led to the disruption of the disc. Hope you found that explanation useful. Do you have any questions? Leave them in the comments below. If you enjoyed this video, please subscribe and get more videos here on my channel. Hit the notification bell so you get an immediate updates and videos on my channel so you don’t miss out on any fresh content. Thank you for being a subscriber of my youtube channel and I’ll see you again in the next video. Posted in City Vaughan chiropractic clinic, Corrective Chiropractic, Dr. Walter Salubro, How Chiropractic Helps With Disc Bulges, Town of Maple chiropractic clinic, Videos | Comments Off on Can an L4 L5 Disc Bulge Be Cured? Hey! It’s Dr. Walter Salubro here from Back to Health Chiropractic Centre. I’m a chiropractor in Vaughan and the chiropractor who wrote this book, Back to Health by Choice: How To Relieve Pain, Conquer Stress, and Supercharge Your Health the Chiropractic Way. And if you have back pain, I want to give you couple tips on helping you get through back pain struggles, especially if you had chronic back pain and have tried therapies or drugs or different things and still have the problem. There’s a couple of things we need to get when it comes to resolving back pain. And the number one thing is having a proper diagnosis—truly discovering the reason why you have back pain. And one of the most common reasons for back pain is because of a musculoskeletal problem, usually along the spine. So let me explain. So here’s a model of the low back. Low back is made up of five bones. They’re called vertebrae and in between each bone are discs. They act like shock absorbers. And we know from research in science that the spine needs to have a certain shape from the front, which is straight and have a certain shape from the side, which is curvy and then the back, low back in this case, it’s elliptical in shape. And there are lots of structure that relates to the spine, which makes the back very, very complex. So there are the bones, the discs, there’s nerves that come out from the side, both sides of the spine. And on the inside is the spinal cord, which connects brain to the body. So you can imagine how important the spinal column is because it protects your nervous system, your spinal cord, your connection between brain and body, which controls everything—not only how your body functions but also how your body repairs and heals. And that’s key. So when back pain is involved, there is usually four main structures along the spine that are affected. That will give you insights to why people get back pain, why you get back pain, and why it’s important to discover what’s causing it and getting it corrected. So let me explain through this model here. So here’s another segment of the spine. It’s a spinal model. So you have the bones, discs, muscles, nerves and what attaches the muscles to the bones are called tendons. So when there’s a spinal misalignment, and I have to basically shift the spine so you can see that. So let’s say the spine is shifting like this; it’s out of alignment. A few things happen. You notice here, at the disc, it’s being compressed. So when the spine is being shifted, the disc is being compressed. Okay. The muscles are being stretched out. The tendons that attach the muscles are being stretched out and the joint capsule over here on the back is also being stretched out. So four structures are involved along the spine. There is the disc, which is being disrupted and injured. There are the muscles that attach the vertebra that are being stretched out. There are the tendons that attach the muscles to the vertebra that are being stretched out as well. And then there’s the capsule, which is this ligamentous material that closes the joints, that keeps it in place. So whenever there’s a spinal misalignment or subluxation, that will trigger information to the brain that something is off. So all those structures—the discs, the muscles, the tendon, the capsules of the joints that are on your spine—when there’s a spinal misalignment, so it should be straight from the front, curvy from the side—when there’s a spinal misalignment that’s out of alignment, that’s not good, that’s called the spinal misalignment or subluxation. Those four structures—discs, muscles, tendons and capsule—will be disrupted and it will send messages to the brain that something is off. Now the brain will try to correct it posturally, causing muscle spasms to try to realign that, causing signals of there has been injury there. So inflammation is being triggered to try to heal the area. So when there’s inflammation, typically along the joint capsules, and the disc areas, those are highly pain sensitive structures, chemical mediators are released that are noxious to the tissues and there’s swelling in that area. So it’s very, very painful. And that’s why back pain is a big problem because it’s painful and if the cause is due to a misalignment of the spine, subluxation, then it’s important that it gets properly diagnosed. That’s very important. So as a chiropractor, my objective is to discover if the back pain that you come in with is caused from the spine and these structures. Because if it is, then it’s a chiropractic case and it’s something that we can help correct. So the second important thing, other than discovering what the true problem is, is to actually finally correct it. And there’s a lot of ways to relieve back pain. In fact, I’m writing a new book that’s called Back Pain Resource Guide. I’ll talk about that in a moment. And I’ll have a lot of tips in there on how to relieve back pain at home and get through back discomfort. But what’s key is to correct the underlying problem that’s causing the back pain. If it’s a distortion on your spine, causing distortion on the structures that are triggering inflammation and pain, that needs to be corrected. And that’s what chiropractic does, it helps correct those spinal misalignment problems to relieve the distortion on those four structures, decrease the inflammatory process naturally, and then the brain now has an opportunity to send healing messages to that part of the spine or the back. Now, let me give you a case report. This is a very, very recent brief case report to illustrate this. I had a patient that came in this week. This man, he had back pain for several months to a year and not only was the back aching and hurting, but the pain was traveling down the leg as well. And he’s been to a physiotherapist. He’s been to massage. He’s been to exercise, tried yoga, tried drugs and medications and sometimes they’ve helped, those treatments, and sometimes it made things little worse. That happens sometimes. But the key is that the problem never got resolved. So they were finally referred to my office. And we did a full checkup, range of motion, stress scan on the nervous system, posture check, we did a lot of things. Checked the spine for shifts and subluxations. And this is what I’ve discovered, really interesting actually; here is another model of the spine, same idea, spine, right? This one here has the pelvic bones, right? So this person’s subluxation was where the pelvis was actually rotated backwards. There was a rotation in the pelvis backwards. Now, I identified that through specific tests that we do. And then I gave this person an adjustment the same day. And I’ve essentially corrected that misalignment. And I told him how to do some things at home to help relieve that. A day went by, I called the patient the next day and asked him how he did with the adjustments and how the back is feeling. And this is what the patient said, is that, “This is the first time in the last six to twelve months after doing all these therapies that I’ve done that I finally got immediate relief of their low back pain.” Why? Why that happened? Two reasons. One, because the problem was discovered. And two, because it was corrected properly. Now, we need to do more work on this person to continue the correction, maintain it and do some rehabilitative work, exercises to help strengthen the core, and all that to prevent injuries in the future. But that illustrates how important it is to discover the main problem properly and then correct it. And if it’s a spinal problem, that’s a chiropractic case that we can work with. So I hope you found that useful and valuable. If you liked it, please give some thumbs up. Give some comments below. I love to answer your questions. Share this with a family member or friend that may find this useful too, especially if they have back pain. And also, I want to tell you about something exciting I am working on. It’s a book that I am writing. It is called The Back Pain Resource Guide. I am releasing it in the New Year and if you want some input into that book, and you have a question about back pain, let me know. Click on the link on this video. That link will take you to a form where you can actually ask your question, submit it with your email address. And what I’ll do is I’m going to compile all these questions and make sure I don’t leave anything out in my book, which is called Back Pain Resource Guide. So I’ll put those answers into that question. So it actually serves the needs that people and readers want when it comes to back pain relief. So be sure to click on that link. Leave me your response and in exchange, I’m going to give you a free copy of the book when it’s released in the New Year. I’ll give it to you by email just for your contribution to the back pain resource guide. Hope you found this useful. Give me some thumbs up, like, share with your family and friends and leave some comments below. And don’t forget to leave your question on that link provided in this post. This is Dr. Walter Salubro and I’ll talk to you again soon. 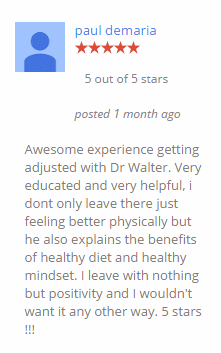 Hey it’s Dr. Walter here from Back To Health Chiropractic Centre, right here in the beautiful city of Vaughan. Thanks for coming to this video, whether you are on live or watching it later on, on this Facebook post. I’m the author who wrote this book Back to Health by Choice, How to Relieve Pain, Conquer Stress, and Supercharge Your Health the Chiropractic Way, and am working on a new book now for people that have back pain, people that are struggling with back pain. I have several videos up there on YouTube that gives people with back pain relief tips, and I am going to give you two tips today on how to relieve back pain at home and one of the things that I realize is that in our community of Vaughan, there’re a lot of people out there that are struggling with back pain. They may have tried other resources, they may have tried other therapies, maybe even drugs, possibly have tried surgery or on their road to surgery or had surgical consultations and there’s a big impact on how their back pain is affecting them and my concern is that they are not just getting the answers or solutions that are suitable for them. So I want to reach out to people in our community and give the answers or solutions to back pain that has been working for our patients in the last 16 years here at Back To Health Chiropractic Center. And I want to put all of those resources and tips and strategies and theories of back pain and how to prevent and deal with back pain in this book that I am calling Back Pain Resource Guide. And I’ve been getting questions from a lot of people out there in our community so what I am asking you today is to ask me your number one, your biggest question about back pain, no question is too silly. It could be anything and there’s a link on this video right here on this post just click on that link. There’s a little form where you can actually add your question there and your response to your question and then click submit and in exchange for your effort and for your input and me writing this book am going to give you, one of the first people that has access to a free copy of Back Pain Resource Guide when it comes out, just to say thank you for your contribution for me helping write this book. So, if you have a question make sure you click on this link that you see on this post and then give me your questions so I can include the answers and questions in the book that I writing. So before you go on this video I want to give you a tip when it comes to getting relief from back pain at home. One of the most common questions I get asked when it comes to relieving back pain is when do I use ice and when do I use heat? And I could tell you, for all the new patients that come into my office a lot of them ask me that question and most people get it wrong and they are trying all kinds of different things and they are hearing advice from all different people but I want to level the record straight when it comes to when to use ice and when to use heat. I will tell you what I tell my practice members and patients that has back pain. So let me give you some examples here. This is an example of an ice pack. I just took this out of the freezer right now we have a little freezer in our office and this particular gel pack can be use for ice, ice pack when it’s frozen or can be used for heat by heating up in the microwave or in boiling water. So the best time to use ice is during an acute injury, we have an acute injury, an acute back pain, what does an acute injury means that means a brand new back incidence or a brand new back pain that just happened and up to 3 days. The reason why is you want to have a strategy to cope with that pain naturally and ice is a very good strategy to put on the injured area of your back to help numb the pain, right. It will reduce the inflammation a bit it will cool the area down. But the key thing is to help you cope with the pain and help numb the pain for several days so the acuteness can come down and you can get functional again. So I recommend ice in the first, second and third day possibly even up to the first seven days but not past seven days. For sure in the first three days but not past seven days. You want to use ice during an acute immediate injury or a flare up. If you had back pain for a long time and you had an acute flare up then you use ice again during that flare up. You don’t want to use ice if you had back pain for a chronic time, so, three months, six months, a year, two years and beyond, it’s a chronic back pain. You don’t want to use ice for chronic back pain. The reason why is there is an inflammatory process that’s occurring when you have an injury and there is an acute inflammation and chronic inflammation, but inflammation even though it’s painful and causes swelling and redness and decrease in function. Inflammation is the body’s way for you to heal the injury, the injured tissues, so, in the first few days inflammation is important but you want to cope with the pain so it is good. Later on when back pain becomes chronic, hopefully it doesn’t but when it becomes chronic you need an inflammatory process to help induce that healing process in the body. So you don’t want to minimize inflammation with ice, and how does ice minimize inflammation? Well it decreases the blood flow to area and blood brings the immune cells that trigger inflammation in the body. So Ice is good for the first three days and not during chronic back pain episode. The other scenario is heat. This is an example of a heating pack. Now this is an electric heating pack. I really like this because it gives off a moist type of heat and moist heat is the best for your body. There are other types of heating packs. There is a water bottle and of course you can use one of these gel packs when they are heated up. So when do you use heat? First of all don’t use heat in an immediate injury, an acute injury or an acute flare up because it’s just not going to feel comfortable on inflamed tissues So you want to use heat after seven days and certainly if you have a back problem that has been existing more than three months, six months and definitely beyond a year, so chronic back pain. Why is heat good for chronic back pain, for back pain that has been persisting for a long time? Because heat helps bring blood to the area, helps bring healing chemicals to the area, and helps the blood vessels dilate and flush out any toxins any noxious toxins from the inflammatory process that are triggering the nerves and getting them pain sensitive. So that’s number one. And also it relaxes muscles, makes it feel good, and decreases muscle tension. So it’s a good way to cope with chronic aching back pain that has been around for six months, a year, or more. Now when you are using ice or heat, there are several protocols to follow. Number one, and this is for both, so number one, don’t just put a cold ice pack on your skin and don’t you put a hot pack on your skin. Wrap it around with a towel. It could be a moistened face towel, it could be a paper towel moistened is fine and dry is okay too, to protect your skin. that’s number one. Number two, I usually tell people to put an ice pack on for about 5 minutes, 5 minutes is usually enough and for heat I tell people to put on for about 10 minutes so you want to set a time limit. 5 minutes for ice and 10 minutes for heat and don’t repeat it every 10 to 20 minutes. Wait about an hour and then repeat it again if necessary every hour. So these are two tips on how to cope with back pain at home. There is ice for acute injuries and heating pack for the chronic aching back that has been around for a long time. okay. So hope you find that useful. Give it a try if you have a sore back, whether it’s acute or chronic and you will see that they will relieve you. Now, thank you guys for watching. If you have a question about back pain, don’t leave it in the comments below. Click on that link on this post and leave your question about back pain and I will make sure it is answered in the new book that I’m writing which is to be called Back Pain Resource Guide and then once you click on that link make sure you put your email because when this book is ready, I will email you a copy of the book. So thank you again for watching, I am looking forward to talking to you guys soon. Canada is the World’s second largest consumer of opioid drugs (per capita). 1.6 million prescriptions of opioids were dispensed in Canada in 2016, up 60% from 2011. 410,000 Canadians report abusing drugs like opioids pain relievers. 2458 people died of opioid overdose in Canada, 2016. Chronic pain is one of the main reasons why people are taking opioids. There must be another solution to dealing with chronic pain. Chiropractic helps many, many people who suffer with chronic pain, naturally without drugs. Chiropractic adjustments have been shown to increase the release of endorphins, which naturally occur in the body. If you have chronic pain, visit a chiropractor near you. Discover chiropractic and start feeling great again. A public service announcement by Dr. Walter Salubro, chiropractor in Vaughan. Hey! 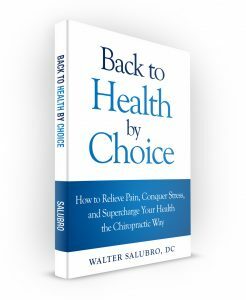 It’s Dr. Walter Salubro here from Back to Health Chiropractic Centre, Chiropractor in Vaughan, and the author of Back to Health by Choice: How to Relieve Pain, Conquer Stress & Supercharge Your Health the Chiropractic Way. And today, I want to give you a tip on how to strengthen the low back. So follow me. Check this out. Now, in this video, I’m not only going to show you an exercise that helps to strengthen your low back but this particular exercise also help improve muscle activation, muscle firing patterns in the thigh area, buttock area and lower back region. And that’s important because one of the most common elements that I see in our patients that have low back pain is that their muscle firing sequences in their thigh, glutes and lower back region is disrupted. It’s out of balance. And that can cause further muscle problems, further back pain, and also delay the healing process. So this exercise is very important to help strengthen the low back, rehabilitate it, improve the coordination and the muscle activation. Thereby, decreasing the stress, tension, pain, inflammation on low back while making it stronger.